Jakspa Staffords is the Prefix of the King family who live at Singleton, in the heart of the NSW Hunter Valley. The area is well known for its diverse agricultural holdings ranging from some of the country’s finest vineyards and thoroughbred horse studs through to its mass reserves of coal. 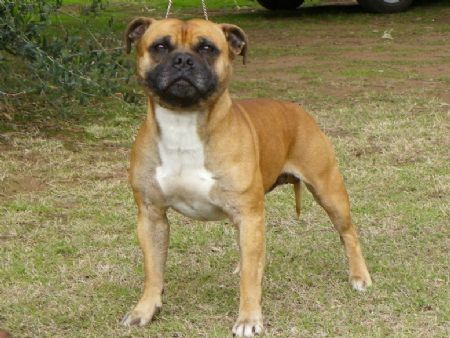 At Jakspa Staffords our bloodlines hold many older pedigrees incorporated with newer lines and strong English pedigrees. Our dogs are raised in a fun family environment, and we only breed when we are ready for a new member of our own four-legged family. Pups are not readily available and if you are interested in adopting a Jakspa pup we encourage you to contact us via email with your details. We will then contact you and talk further to see if one of our pups would suit you. If all goes well then you are invited to put your name on our waiting list and we will update you on future pups. We thank you for taking the time to view our site and hope you have enjoyed your browsing.